"Selling prohibited goods online often requires an age restricted gateway before entering your website. Comply with state or federal regulations with the Age Verification app." Require 'Age Verification', in order to permit access to your web store. The application features a pop-up notification panel, prior to browsing, with birth date calculation requirement, that then looks up the self-administered settings and grants or denies access, accordingly. Depending on the products that you sell, restricting access to your web store by age significantly assist your business in conforming with government laws and regulations. 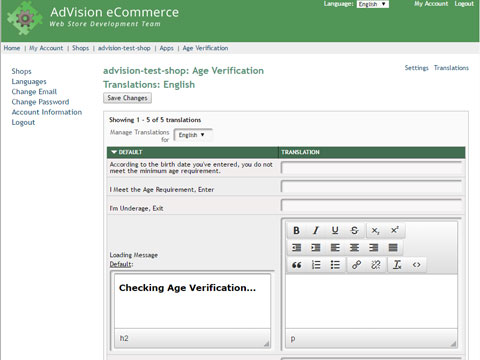 The Age Verification application is a pop-up panel that is presented to new visitors of your web store that asks them to verify their age or, be direct it away from the web store. It features self-administration on the following items. 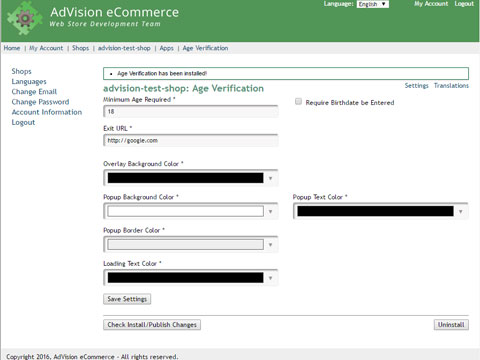 Minimum Age Required - allows you to set how old users should be to enter your Web Store. This defaults to 18, but you can set it to any number you like to determine the required age for entry. Required Birthdate be Entered - if you want to make your users enter their birthdate in the age verification popup, check this box. When checked, the user will be presented with month, day and year select menus to enter their birthdate into. The birthdate entered will be compared to the Minimum Age Required setting to ensure what the user has entered meets the required age. Exit URL - if a user does not meet the age requirement, the popup provides an "exit" button to send the user elsewhere. Using this setting, you can provide the URL you want to send the user to if they choose not to verify they meet the required age. This defaults to send the user to http://google.com (Google's homepage). Overlay Background Color - when the age verification popup shows, it display any overlay color in the background (which covers up the content of your site). Here you can choose what you color you'd like to use for that overlay. Popup Border Color - a small border lines the popup box, this allows you to set the color of that border line. Loading Text Color * - when a user first visits your site, it can take 1-2 second for the age verification to load. During this time, since the user has yet to verify their age, we hide your site content and simply showing the age verification loading text. This setting lets you set the color of that text. The Age Verification application is available in English, Dutch, German, Spanish and French.